The location of your wedding is probably the most important consideration if you are looking to be married on Oahu. My best advice is to get married close to where you are staying. 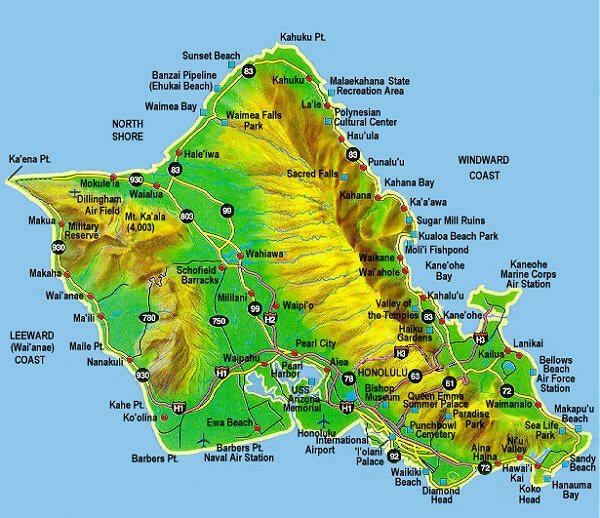 The most popular areas are near Waikiki and the North Shore. Still plenty of other options exist. See our Waterfalls and our Private Wedding and Reception Site. Magic Island: Magic Island is just outside of Waikiki (see it in the background) that sits out on a man-made peninsula within the larger Ala Moana Beach Park and across from the landmark Ala Moana Shopping Center. It’s has a great view of Diamond Head, sunset light, flat lawn areas, ample parking (on weekdays), with easy access for guests. It’s a popular beach park area though, large enough (we feel) to provide enough “space” to have a great wedding ceremony without people close at hand. We like it! We do the ceremonies on the park area up against the ocean to get an unobstructed view though we can do it where ever you please. While we can do beach shots, it may not be as good as a natural beach because it’s below the park ground level. This is a public park that sits along the coast just outside of Waikiki. It fronts the ocean bordered with a large ocean breaker wall. It has a broad brick sidewalk, hilly features, and a hilltop lookout. The main attributes are it’s scenic value, it’s right on the ocean, sunset view, proximity to Waikiki, plenty of parking, easy access especially for older family. There is no beach. We normally do ceremonies for very small parties on the bolders for the best unobstructed view and on the walkway for larger parties, or up on the hilltop lookout or grassy knoll. 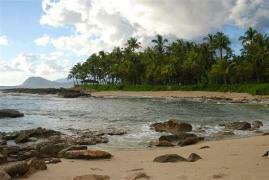 This is a small, very private cove located in the Koolina area. This area is about 45 minutes to an hours drive from the Waikiki area. This is a beautiful white sandy beach on the Windward side of the island. Parking is in the residential areas and can be difficult on weekends. It’s not so bad on weekdays. It’s just a short walk to the beach and very accessible. Plan for 45 minute travel time from Waikiki. This is a small park about 15 minutes from Waikiki. The beach is nice, there are some low coconut trees and shaded areas. It’s a popular location for many Hawaii wedding websites because of it’s convenience consequently, there may be one or more weddings happening at the same time. This is the one beach in Waikiki where you can still get married. Next to the Hilton Hawaiian Village. Great views of Palm tress and Diamond Head in the distance.